A pregnant mother is in prison after she "stood her ground" and used her legal gun to defend her family—and the NRA's support is nowhere to be found. As the National Rifle Association holds its annual conference in Texas, a mother is sitting in prison in Michigan, where she will soon give birth to her second child, as she spends the next two years serving the mandatory sentence for felonious assault and a felony firearms conviction. 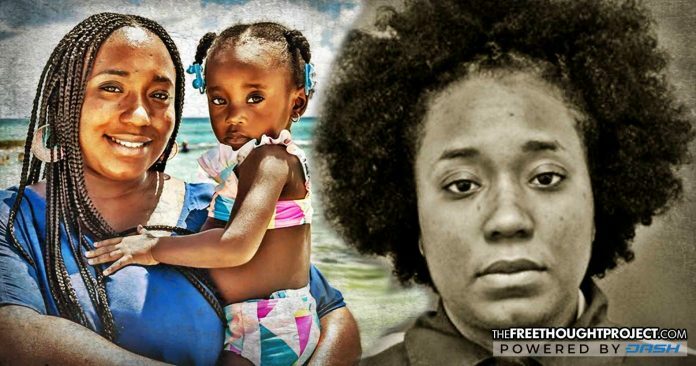 But Siwatu-Salama Ra, 26, was a legal gun owner with a concealed carry permit in a state that allows open carry, and when she pulled out her gun, she was defending herself, her mother and her 2-year-old daughter. The incident occurred in July 2017 at Ra’s mother’s house when there was a conflict between Ra’s niece and a friend. Ra ordered the friend to leave the property, and when the friend’s mother, Chanell Harvey, drove to the house to pick up her daughter, a verbal conflict with Ra ensued. Ra’s legal team told the Metro Times that Harvey attempted to run over Ra’s mother and started ramming her vehicle into Ra’s car, while Ra’s 2-year-old daughter played inside. Ra responded by reaching into her glove box and pulling out her legally registered handgun, which was unloaded. While Ra’s decision to point the gun in Harvey’s direction stopped any further aggression and resulted in Harvey finally leaving the property, but she did so after pulling out her phone and taking pictures of Ra holding the gun—raising questions about whether she was actually concerned that Ra was going to use it to shoot her. Harvey went straight to the police and claimed that she was the victim, and Ra was the aggressor who confronted her with a gun in her hand when she attempted to pick up her daughter. Ra also went to the police on the same day and filed a report claiming that she was attacked by Harvey and she pulled out her gun to defend herself and her family. However, three weeks later, a SWAT team broke down the front door and raided Ra’s house, and she quickly learned that law enforcement had already chosen a side in the case. Her lawyers told the Metro Times that a detective from the Detroit Police Department testified in court that “the department considers the person who arrives at the police station first to be the victim,” which automatically made Ra the aggressor, even though she arrived hours later to file her own report. When the case went to trial, the court had little mercy on Ra, and her attorney, Victoria Burton-Harris, told Vox that she believes the jury was not fully informed on the facts of the case—which were not accurately collected by detectives who sided with Harvey—and they were not aware that a conviction carried a mandatory sentence. “This case was simple—a black woman, a mother, a daughter, an activist was afraid—and it didn’t matter. Her fear wasn’t significant enough for a jury of her peers to believe it. We’ll never know what more she needed to endure to justify her fear. She stood her ground and is now serving a mandatory two-year prison term. It’s a hard pill to swallow,” Burton-Harris said. As the Metro-Times reported, before Ra was labeled as a convicted felon, she was an outspoken activist in Detroit who educated young mothers on nutrition, and she served as the co-director of the Cass Corridor’s East Michigan Environmental Action Council. While the NRA proudly touts the increasing number of women and mothers who are carrying concealed firearms and actively working to protect their families, it has stayed eerily silent when it comes to Ra’s case. This has left many to question if it is because Ra is Black, given the fact that the NRA has failed to speak out when Black gun owners are targeted or killed by police, even when they are following the law. If the NRA actually cared about the Second Amendment and Americans’ civil liberties—instead of just how much money can be raised and how much public support can be garnered from powerful politicians—then it would be adamantly speaking out about the unjust arrest, conviction and overall treatment of Siwatu-Salama Ra, a mother who was wronged by a corrupt justice system and now will never be allowed to legally protect her family with a firearm again.